Steven M. Hughes local Richmond, Virginia insurance agent. Born and raised in Richmond, Virginia, Steven Hughes attended Virginia Commonwealth University and majored in Business Administration. 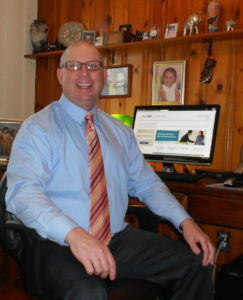 Steven has been in the insurance industry since 1991 as both a career agent for Life of Virginia and later starting his own insurance agency in 2001. Utilizing my extensive experience and knowledge of the insurance industry, I am better equipped to service your insurance needs. The goal for my agency is to build long lasting relationships with my clients. I want to be your agent for life and for the generations to come. By representing many insurance companies, I can shop around for the best price and products for you. My staff and I are always available to help with all of your insurance questions, needs and concerns. My core values include honesty and integrity when dealing with my clients. I take pride in representing you as my client and meeting your needs. My wife Nancy and I have a daughter named Grace. In my spare time, I enjoy yoga, reading, water skiing, and pretty much anything outdoors.